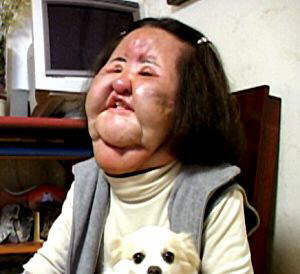 Her name is Han Mi Ok, a Korean celebrity who became known as 'Fan Lady' after her disastrous cosmetic surgery. 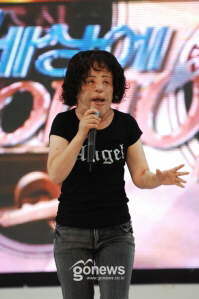 She underwent 15 reconstructive surgery to overhaul her 'I-don't-think-it-can-be-fix' plastic surgery damage. She apparently became obsessed addicted to plastic surgery and couldn't get enough of the 'faux-fect face' ( I made the word up) so she went to quacks just to indulge herself. She even personally performed a facial injection at home. The result¡­. well you can see it. On the photos above, Han Mi Ok was at the shooting of of 500th episode of Shocking Stories of the World. I admire her courage to display her damaged face in public and let people see how ungodly it is to distort ones appearance. I am not totally against plastic surgery but I am also not for it. She should serve as a lesson to anyone who dreamed of having a 'faux-fect face'. Think twice before you get cut up and think thrice before you inject yourself with human byproducts. DO NOT, DO NOT INTERFERE WITH NATURE.